Trailing succulent. Very delicate stems. 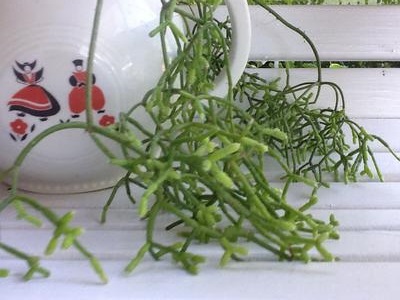 Grows up in shoots then slowly bends and starts hanging down with segments and branches growing off of the shoots. Had in family for 50 yrs. That might give you a starting point at least - sorry that I can't be more precise, but the pictures aren't really clear enough to see the texture of the leaves (really modified stems).